I was asked earlier this week by a colleague to recommend some ways in which iPads can be used to support students with PMLD (Profound and Multiple Learning Difficulties). I’m embarrassed to say that it’s an abbreviation I hadn’t come across before so I’ve got my ‘learn on’. • some people with PMLD will have an identified syndrome or condition but most will have no specific diagnosis. It’s quite a staggering array of difficulties. There are lots of ways in which you can use an iPad to help students with these difficulties. As with any learning need however, whether it’s student who is looking to communicate through technology because they suffer with a condition such as Phelan-McDermid Syndrome and so uses Proloquo2Go or a student who likes to search visually and so uses Pinterest, we have to look carefully at the learning needs of the individual and what their needs are and how we can best meet them. With that in mind I’m going to recommend some Apps that may be of assistance and some further reading that will hopefully get your teaching creativity juices flowing learn a lot from too. Before that though I’m going to go through some reading that might help get you thinking about SEND and PMLD and technology too. As with PCK, and the argument that great teaching can’t come without great pedagogical and content knowledge – without great TPACK (technological, pedagogical content knowledge) you can’t easily make informed choices about the technology that can best suit a situation with an individual student. The books here serve to offer up ideas and learning about using iPads in innovative ways, and for those who are new to them, there’s the iOS 101 book which should certainly help to get you started and if not should get you started thinking. Don’t forget to check out the rest of the One Best Thing series in iBooks. They’re superb. For the rest of the post, I thought it might be helpful to think about some of the bulleted list of difficulties from the definition and the sorts of tools, features and aspects of the device that would help students with PMLD. 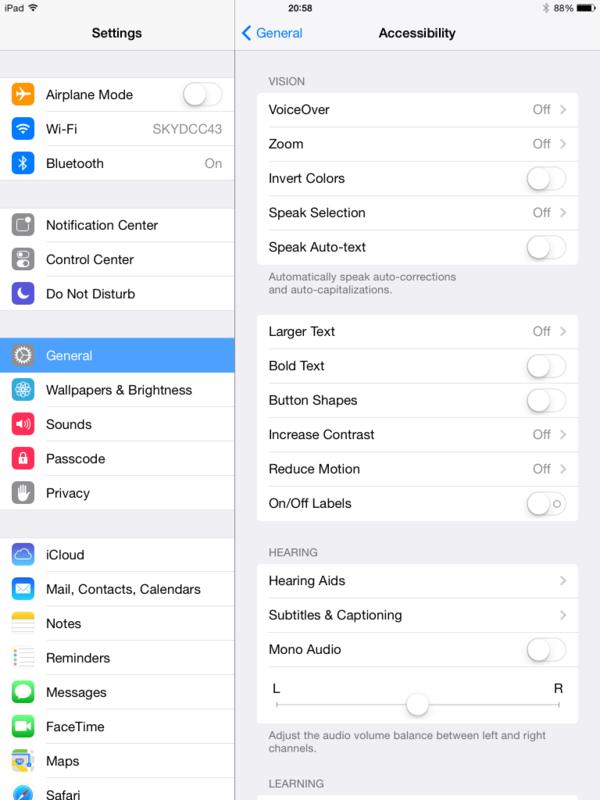 The iPad has great accessibility features for users who have sensory impairments. As you can see from the screenshot below, there are lots of options there to help and more too if you scroll down further. Don’t forget to have a look! The obvious App to help here is one mentioned earlier: Proloquo2Go. Non-verbal communication happens in lots of ways however, and so students who are non-verbal will want to be able to express themselves in many other different ways. Say Anything is a free app which puts streaming messages across the screen and this could be useful. Other apps such as Moldiv / Pic Collage / Keynote / Paper by 53 allow students to express themselves through images, photographs, text, presentation and drawing. There are obviously many, many more but these are, in my experience, popular Apps with students. Give them a try. There’s no real App for this, but for those with physical disabilities I would imagine an iPad could be a real lifeline to learning opportunities. Access to courses via iTunes U for example and iBooks would really help. In an education setting, where PMLD students may have poor attendance due to their disability, the ability to access learning resources from your teacher any time, any place is a great thing to have. The ability to set lessons remotely with all of the resources set up using Apps such as Nearpod to enable those students who haven’t made it to school would be of benefit too, as well as being able to set them as a homework too. With the increased potential for students with PMLD to be more accident prone, having such disabilities and where some of them have challenging behaviour, it would be desirable to make the device well protected using a case such as the Survivor case. If you wanted something with good protection but less restrictive access to the screen, the STM Dux case is robust with solid plastic covering, similar to that of the Survivor but far less restrictive when it comes to the screen. Challenging behaviour can often be channelled through engagement and the iPad is very engaging. Sometimes too engaging. The guided access feature would be helpful in circumstances where students cannot focus enough to stay in the App you want them too. This post is obviously an exploration of my thoughts around the topic but I’d love to hear what your experiences and ideas are around the topic. I hope you’ve found my thoughts helpful. Good to see this topic getting some visibility. Check out http://riasenteacher.blogspot.co.uk/ for some interesting comment on the subject, if you’re not there already. Of course nothing works like trying things out in real settings. Will be interesting seeing what you come up with given what seems to be your outsider looking in perspective: I’m sure you’ll think of angles that will prompt and stimulate. iPad use for recording the learner, sound and pictures, and playing back to the learner seems especially powerful in a context where pupil reflection in plenaries is quite challenging to say the least. The portability, personalisation and immediacy of the tool is one of the main benefits. Get meaningful apps for a given child and you’re away. Learners who are working on cause and effect, hand eye co-ordination, visual tracking and the like – there are lots of simple apps that are very effective. Trouble as ever for a teacher is finding time to track them down, load them up, try them out as well as all the other stuff we have to do. Will follow with interest. Great post – I have been collaborating with an excellent Special School who now use iPads as Total Communication – Proloquo2Go is used as the core app. Not only to communicate with but also as a home/school communication aide. Pictures are taken and notes made to explain what has been done in school or vice versa. Different folders can be created for circle time or a specific subject. It really is a fantastic app. ChoiceWorks has been one we are using in mainstream for those with ASC – it allows students to create visual timetables which they can move from left to right once completed and with a timer in the middle which is useful. Finally we have both found (special and mainstream SEN) that having a planned toolkit of apps is really important to stay focused on integrating the apps for learning and access to learning. Thanks Jules. I wouldn’t say I’m introducing the subject but hopefully contributing to the sharing and discussion. Really great to hear from you as someone who is doing it right at the chalk face. It’s good to hear about consistency of experience. It really does help with the learning. With the wheelchair holder, it really is the simple things which can have a massive effect, isn’t it! Thanks for commenting. Appreciate you taking the time. You might want to look at the results of a two year professional learning community into looking at iPad use with PMLD pupils. 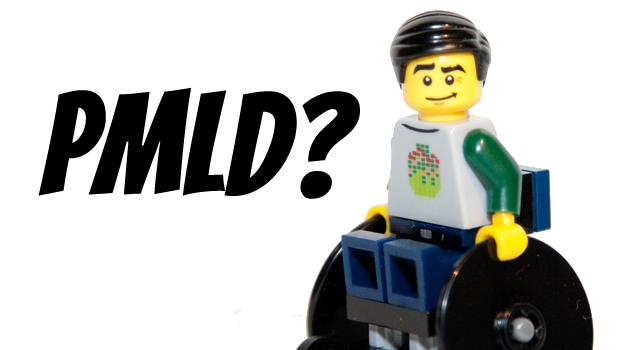 I think maybe proloquo is too advanced for many PMLD users. Also this video will show some of these apps in action. And of course Richard Hirstwood has a whole you tube channel which has lots of sensory apps for PMLD pupils. This is an interesting thought process- but perhaps better suited to students working at a higher developmental level. Children who have PMLD are working at the earliest developmental levels, more 2-9 months than 18. Many remain at a pre-intentional level of communication throughout their lives, so using the iPad to focus on anticipation, responding, contingency awareness and visual stimulation is ideal. I use iPads extensively with my PMLD class, using Apps such as Big Bang patterns (inclusive technology) Fluidity, and Thumb Jam among others. Connect the iPad to a wireless vibrating speaker and a projector, and you have an instant immersive learning environment. Although there are some brilliant SEN practitioners working in this field, very few focus specifically on PMLD. Thank you for highlighting the need for this. Rebecca – thank you so much your comment. I really appreciate the level of depth and expertise you’ve shared. I find it really really interesting. I’ll definitely be checking out your recommendations!